"Light Music Recording of the Month"
"This release, taking its title from the opening track, is self-recommending to fans of dance band music – and I’m one of them, despite my predilection for more serious fare such as renaissance polyphony. I enjoyed this very much and the transfers belie the age of the recordings; one or two tracks betray a degree of surface presence rather than hiss or crackle and even these are not off-putting, while the rest are almost completely noise-free. This album is choc-a-bloc with foot-tapping music well performed and in sound that is still well worth hearing. 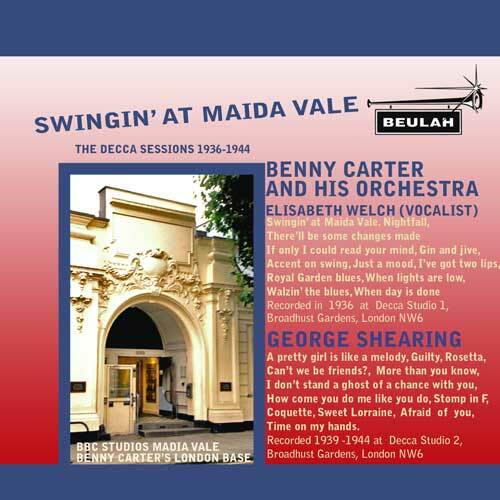 The Benny Carter tracks, made when he was working in England with Henry Hall, cost over £1 when they were reissued on the budget Decca Ace of Clubs label in 1964 – that’s at least £25 in today’s values. Add the George Shearing half of the album – even in an era when the likes of Carroll Gibbons, Joe Loss, Ambrose and Billy Cotton were at the height of their powers his recordings were sought after – and you see what a bargain the Beulah reissue is." " Beulah have already embarked on an attractive series of albums of reissues of classic performances of English music. On the basis of this first volume of a similar French venture, the omens are already looking good. The stand-out on volume 1 is Solti’s L’Apprenti sorcier. The recording was hailed on its appearance as ‘excellent light music to show off your new stereo equipment to good advantage’ and it still sounds very well indeed in this transfer. Fistoulari’s Mignon Overture, from 1945, could hardly be expected to sound as well but in Beulah’s transfer it hardly shows its age and the performance was well worth preserving. By the time that Moura Lympany’s Saint-Saëns was reissued in bogus stereo on Decca Eclipse in 1974, it sounded badly dated. About the quality of the solo performance and the orchestral support, however, there has never been any doubt and Olympia produced a much better CD transfer in 1989 – now sunk with the rest of that label. I didn’t hear that Olympia version but I doubt if it bettered this Beulah reissue which has tidied the sound up to a degree that we can appreciate the Lympany’s performance. It’s still a bit thin, but much more than tolerable. Even if you have a more recent recording this Beulah reissue is well worth the small outlay. Beulah give the date 1958 for the Munch La Mer but the penultimate time that it was reissued, on an RCA Papillon CD, the date given was December 1956. No matter – it, too, has come up well and the performance, if not quite in the same league as the Lympany and Solti items, is well worth preserving." " Klemperer is for me the Brahms conductor par excellence and nowhere more so than in the Tragic Overture, which benefits particularly from his rather weighty style and still sounds very well in this transfer. Not that weighty necessarily means ponderous: Klemperer’s 12:30 is faster than Marin Alsop’s 14:04 and only a shade slower than Riccardo Chailly’s 11:45 with the Leipzig Gewandhaus Orchestra on his new Decca set of the symphonies and orchestral works . Chailly makes the opening of the work sound sprightlier, which some may prefer, but this is the Tragic Overture and, for all that I’ve enjoyed hearing Chailly’s new recordings of the symphonies, I prefer Klemperer in this overture. "The Violin Concerto comes from a World Record Club release and the performance is new to me. Tempo is of the essence in the first movement of this work, with most interpretations taken too slow for anyone who, like me, cut their musical teeth on Heifetz and Reiner, Reiner’s remake with Szeryng or Szeryng with Monteux (all RCA). Wolf and Collins take 22:51, which is around the norm, but a little too dreamy for me, despite the urgency of the solo and orchestral playing. Listen to Heifetz’s 18:51 and I think you won’t want to hear it any other way, but if you still prefer dreamy for this movement, Wolf and Collins could be your men in this good transfer. The YouTube excerpt from the first movement might help you decide. "Beulah make up good value with the Tragic Overture and seven of the Hungarian Dances, the latter taken from a 1953 10” LP (LW5066). Inevitably the sound is several notches below that on the rest of the album but perfectly tolerable, especially as the over-bright top of the LP has been tamed. " " There are plenty of fine vintage and modern recordings – Rubinstein (RCA or Naxos Historical, not including the Op. posth. ; Katin includes one of these) and Hewitt (Hyperion, with Impromptus) to name one of each – but Peter Katin’s interpretations equal the best of them in making music to which I don’t listen very often sound attractive. The recording has transferred well: the piano tone is secure and there is only a very occasional reminder of LP surface blemish. The original review of Nos.11-20 mentioned a slight degree of tonal insecurity but I heard no trace of that on the Beulah transfer. "I’m not sure of the provenance of Toward the Unknown Region – the recording sounds too thin to have been taken from the HMV LP released in 1957 – but this early work doesn’t receive too many outings and Sargent and his team do it justice. The highlight of this album is the very good transfer of the Ninth Symphony. Towards the Unknown Region and the equally neglected Tuba Concerto are bonuses.Shake off memories of Tubby the tuba and it’s an enjoyable work in a fine performance. There are a number of modern recordings but this reissue has come up sounding remarkably well. " • SS WESLEY Magnificat in E [7:23] • Sir Hubert PARRY I was glad [6:20] Festival of English Church Music (1933)/Sir Sidney Nicholson: some surface noise, some harshness of tone and some occasional noises-off apart, these recordings are remarkably good for their age. iTunes reveals the usual ignorance of classical music by attributing all the ‘tunes’ on the album to Sir Sidney Nicholson. • Ralph VAUGHAN WILLIAMS Song of Thanksgiving [14:50] Betty Dolemore (soprano); Luton Choral Society and Girls’ Choir; LPO/Sir Adrian Boult – rec. c.1951. The words spoken by the narrator, Robert Speaight (from Shakespeare and the Bible) no doubt sounded less jingoistic in 1945 when the work was composed and even in the early 1950s when it was recorded. By the time of its re-release on the second side of an LP in 1953, the occasion seemed to have passed and it’s mainly of historical interest now. Betty Dolemore has a rather small but clear voice and the narrator uses the BBC Received Pronunciation of the time. The recording, first released on two Parlophone 78s, was deemed exemplary in its time but it demands some tolerance now. • Benjamin BRITTEN Missa brevis in D, Op. 63 [10:11] Westminster Cathedral Boys’ Choir/George Malcolm (organ). Britten composed this short mass for these very forces. Recorded live in Westminster Cathedral and first released on a 7" EP in 1960, coincidentally at the same time as the King’s LP of Byrd’s 5-part Mass – their recording of the Missa brevis is available on Classics for Pleasure at budget price, with other Britten choral music – the performance is obviously authoritative and the recording has come up reasonably well, if a trifle shrill and with some extraneous noises. This one item makes the whole album well worth having – the tracks can be purchased separately. • Ralph VAUGHAN WILLIAMS Serenade to Music [12:15] Elsie Morison (soprano), Marjorie Thomas (contralto), Duncan Robertson (tenor), Trevor Anthony (bass); LSO/Malcolm Sargent. I’m a great lover of VW’s music and I once, long ago, played Lorenzo in Merchant of Venice, who utters the beautiful words set here, but I fear the Serenade to Music is not for me – a minority view – nor did this performance do anything to endear me. The recording has come up well. " " Among the October 2013 releases and those for September which I didn’t cover last time, 9-11BX7: Léo DELIBES Sylvia, almost complete – the LSO conducted by Anatole Fistoulari (1958), stands out as my personal choice. This Mercury recording has deservedly been reissued in many guises over the years on Philips and Fontana in the UK and was available until recently coupled with Antal Doráti’s slightly less recommendable Coppélia on a 3-CD Mercury set. There are more recent alternatives, some of them attractively priced (Mogrelia on Naxos, Bonynge on Decca) but I see no reason not to stay with this Fistoulari reissue as my prime recommendation. The recording has come up astonishingly well and the price is attractive – £5.25 for the whole ballet. Highly enjoyable. " " The playing is stylish and the recordings are unbelievably good for their vintage, especially when contrasted with most of these other HMS reissues, no doubt ably assisted by some of Beulah’s magic. Two little gems here. " " I enjoyed Thurston Dart playing Girolamo FRESCOBALDI’s Capriccio sopra un soggetto (24BX69) from the same HMS series – playing which still sounds stylish in a thin-ish recording but perfectly tolerable in this transcription. This was singled out from a set of releases in 1954 and it’s one of my highlights, too. " "These recordings are available separately, but together they make an attractive album of the Op.4 Organ Concertos that can still hold its own in many ways against modern recordings such as that of Richard Egarr or Ton Koopman. Richter’s use of a modern full-size instrument instead of a chamber organ would be questionable nowadays, but he compensates by sensitive selection of stops and the use of a chamber orchestra. In their time these recordings were excelled only by Thurston Dart’s greater period awareness – Beulah have already given us Dart’s stylish recordings of Handel’s solo organ music and the Water Music; perhaps we might now have his recordings of the Organ Concertos. With the 2-CD Warner Teldec set of Richter’s Op.4 and Op.7 apparently no longer available, I hope that Beulah will also bring us the second set. There’s a very inexpensive Hallmark download which reproduces the original mono LP sleeve, but I can’t vouch for its quality and one user review on Amazon comments adversely on the quality of the transfer, whereas the Beulah has been done with the usual care and the quality is very good indeed for its age. Even if all other recordings of this music were to fall victim to spontaneous combustion, I’d be happy enough with these Richter interpretations." "Eduard van Beinum’s Haydn is stylish – more stylish than Sir Thomas Beecham’s of a slightly later vintage – and it’s still very enjoyable, but it just lacks that last degree of magic that Beecham, for all his deliberate avoidance of the most accurate editions and period style, brought to the music. There’s no disguising that these are early-1950s recordings, but the sound is as listenable as the performances."